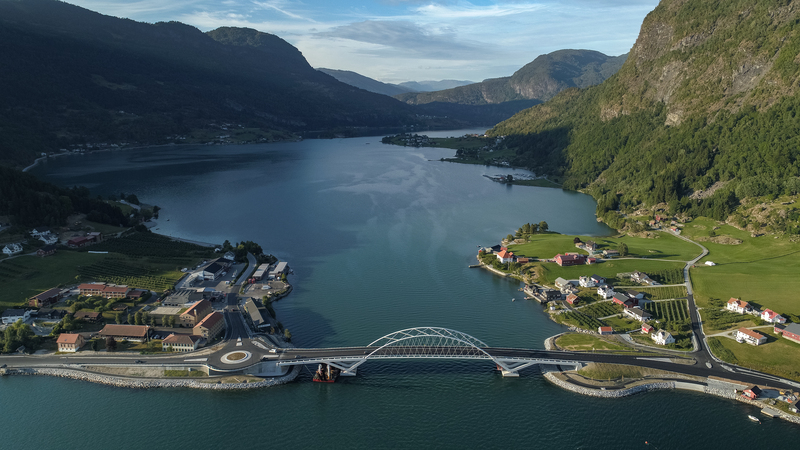 The Loftesnes bridge in Sogndal, Norway, has won the Public European Steel Bridge Award. While it certainly deserves the award, luck may have played a small part in it, too. The number eleven was clearly the project’s lucky number. On 11.11.2015, at 11 minutes past 11, our team from PNC Norge AS and our joint venture partner Aurstad AS signed the contract for the construction of the new Loftesnes bridge in Sogndal. It was a special date for a very special project. The bridge is located on the Sognefjord, Norway’s longest and deepest fjord, which has been a UNESCO World Heritage Site since 1979. The conclusion of the contract and the construction of the project both involved a tremendous amount of work. The Loftesnes bridge consists of a 194m-long steel structure, which was manufactured by Zamet in Poland. The necessary fjord embankments, earthworks and road construction works were carried out by our Norwegian joint venture partner Aurstad AS. The new bridge was opened to traffic in late November 2017. This, however, was not the end of the project. Before inaugurating the new Loftesnes bridge, we had to demolish the old bridge and complete the adjacent streets and new landscape garden, which features amphitheatre-style seating and offers breathtaking views across the fjord. Our efforts have certainly paid off: not just because the project represented yet another opportunity to demonstrate how our intelligent building connects people. The Loftesnes bridge is so special and so beautiful, it even won an award. On 11 September 2018, a delegation consisting of the client, the planner, the steel production company, and PNC Norge AS was presented with the Public Award at the “European Steel Bridge Awards” ceremony in Prague. Sogndal came up with another idea to allow the formerly inaccessible bank to be accessed all the way from the bridge to the town centre. The town invested in a fjord hiking trail with playground equipment for children, romantic perches for lovers, workout equipment for sports enthusiasts, and works of art for culture aficionados. So now Sogndal is situated on the fjord itself.